The Center for Chinese Art at William Paterson University is dedicated to preserving and sharing the artistic heritage of China and integrating its rich tradition into the University's curriculum. Students will not only have the opportunity to view Chinese art, but draw upon its philosophy and incorporate its techniques in order to participate effectively in the increasingly global world of visual arts. The Center also aims to create an appreciation of Chinese art in New Jersey, as well as cultivate a deeper understanding between the United States and China. Sun Nina, pen name JinRan, currently is the associate professor of Chinese painting at JiangSu Second Normal University in Nanjing and a visiting scholar at the Center for Chinese Art of William Patterson University. 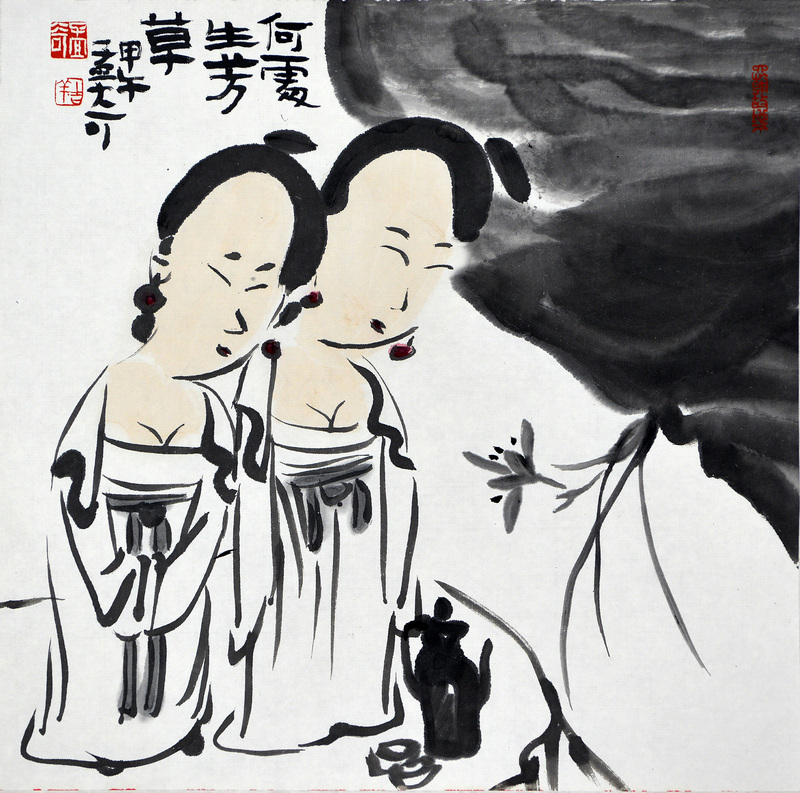 JinRan has a great reverence and deep love for ink painting, she is always addicted to it. 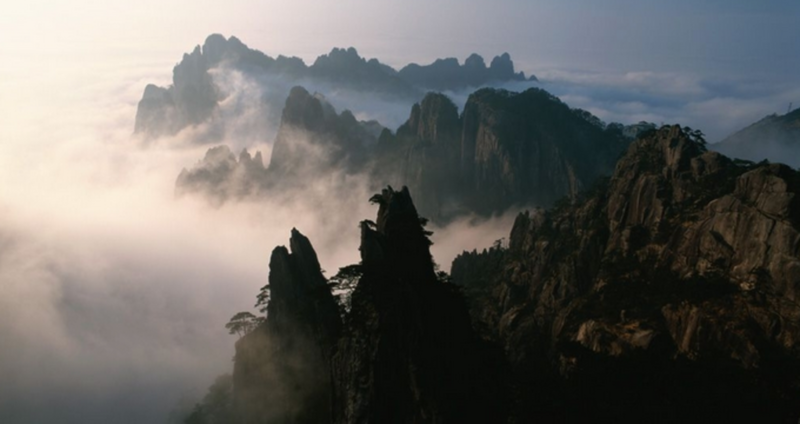 As a rare "traveler" among female artists, she often carries her travelling bags with paintings tools and walks all over the mountains and countryside in China. Learned from nature and accompanied by scenery, she freely sprinkles her brushes and practices her ideals with great enthusiasm to expand her extraordinary creativity and understanding for ink art, with which she formed a unique painting style. Her pictures fully embody freshness, momentum, tranquility and elegance. Her landscape paintings evoke certain awe and respect for ink art. Fu Baoshi (A Chinese- painting master) said painting must have personality at first then it can have a style. JinRanʼs paintings synchronize with her personality, like a cup of tea with simplicity and tranquility, freshness and nature that you can sit with it pleasantly and taste it slowly. At the same time, her paintings are not lack of vigor and spicy. Just as when you engage deep conversation with her, you will feel the true Chinese northerner's forthright and extraordinary temperament in her. To some extent, her paintings are not only a general description but also a reflection of her charm personality which is a remarkably independent character in the current full-of-confusion art criticism era. Employing simple and elegant ink makes JinRan a fresh spring in the complex context of modern ink painting world and brings spiritual sublimation to the viewers. I believe this is the unique value offered to us by JinRanʼs paintings in the context of current ink painting. 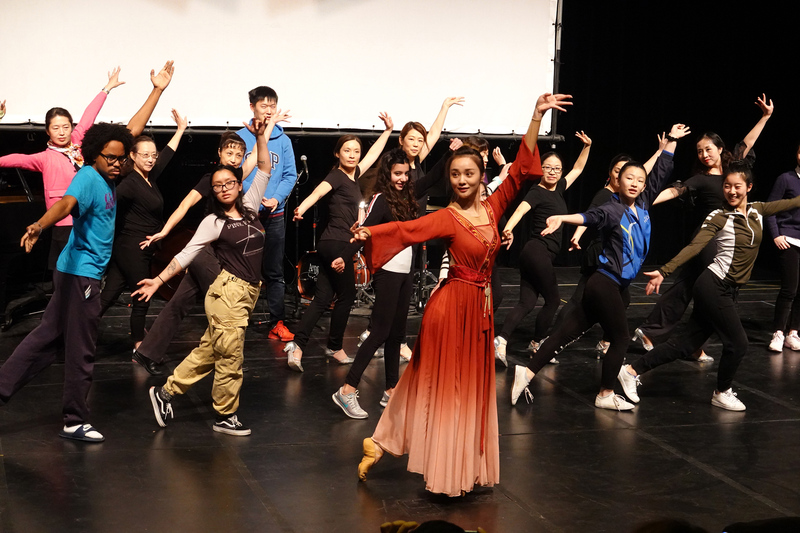 On March 19, A Gathering: Face to Face with the Performance Troupe of Chinese Folk Dancing Drama Princess Zhaojun was held at the Shea Center for the Performing Arts in the William Paterson University. Dr. Richard J. Helldobler, President of William Paterson University, Mr. Jin Qian, Deputy Consul General of Consulate General of the People’s Republic of China in New York, Ms. Chunmei Chen, Chair of the Board of Supervisors of Entertainment Group Ltd. (CAEG) , China, Mr. Ning Xu, Vice President of China National Opera and the Dance Drama Theatre, Mr. Xiuqin Wang, General Manager of China Performing Arts Agency (CPAA), Ms. Yi Yang, Director of the Dance Troupe, China National Opera and the Dance Drama Theatre and other guests attended this event. Over 300 university faculty and students as well as art lovers from New Jersey, New York, Philadelphia and other areas participated in the activities. 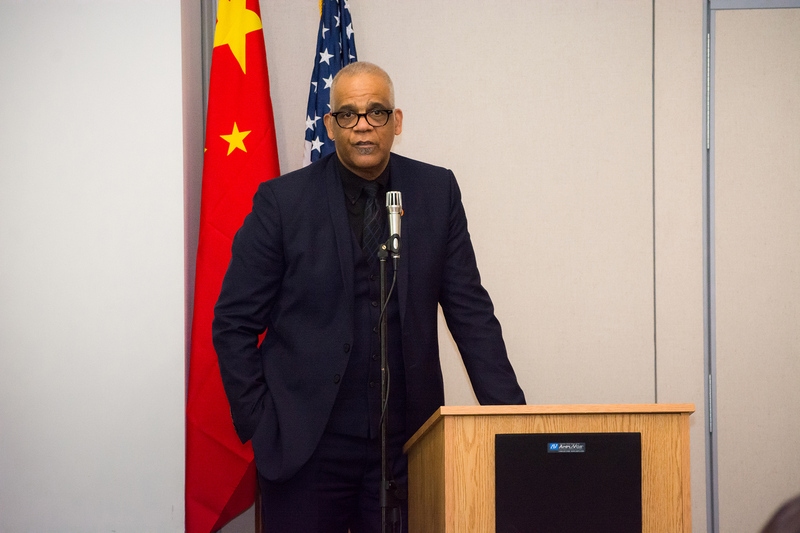 The event was co-hosted by Prof. Daryl Moore, Dean of the College of Arts and Communication, and Prof. Zhiyuan Cong, Director of the Center for Chinese Art at William Paterson University. President Helldobler gave remarks at the opening. 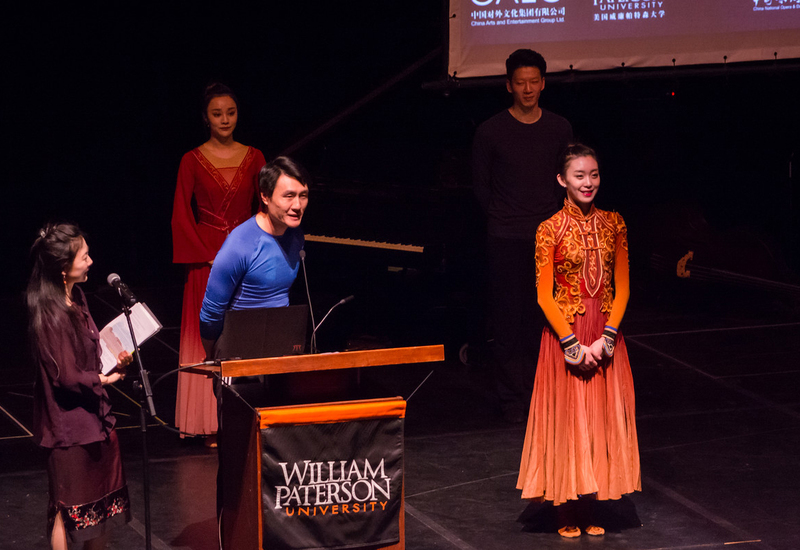 He welcomed all the distinguished guests to William Paterson University and the performers from China National Opera and the Dance Drama Theatre to give lectures. 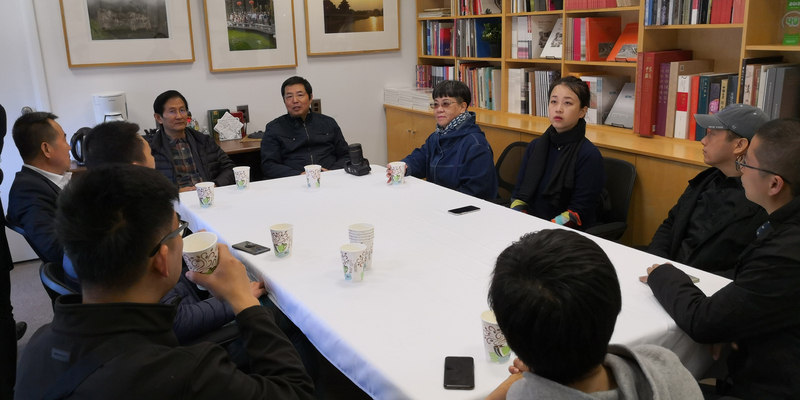 He mentioned that both the performance Princess Zhaojun in New York and the demonstration of Chinese folk dances at the university are of great significance to the faculty, students and the Center for Chinese Art. We sincerely thank the artists coming from afar! On behalf of Mr. Ping Huang, Consul General of Chinese Consulate General in New York, Mr. Jin Qian expressed his appreciation to William Paterson University for its efforts in promoting community diversity. He introduced that Princess Zhaojun has been regarded as a heroine of wisdom and national righteousness and praised as a messenger of peace and friendship among the Chinese people. Today, nearly 2000 years later, peace and development are still the common pursuit of people of all countries. 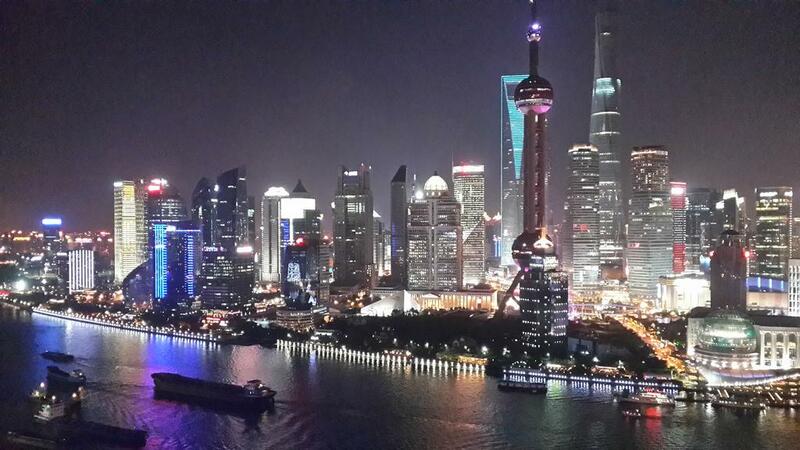 The development of China-US relations in the past 40 years has benefited from the efforts of countless people who share Zhaojun's views on exchanges and cooperation. He praised Prof. Zhiyuan Cong for his efforts to promote cultural exchanges between the two countries, calling him a "true cultural ambassador." Yin Zhu, Deputy Director of the Dance troupe of China National Opera and the Dance Theater, who played the role of Huhaanyeke in the dance drama Princess Zhaojun, gave the lecture. He not only introduced the history and evolution of Chinese dance, the characteristics and differences between Chinese and western classical dance, but also introduced the origin and development of Chinese folk dance, as well as its regional characteristics and cultural connotation. He showed pictures, videos, and demonstrated with his dance partners. Ms. Shuanfang Dou and Jiaxin Wang, who play roles of Princess Zhaojun and Mr. Bin Liu as Huhaanyeke in the dance drama, respectively demonstrated Chinese classical, folk solo and a piece of Princess Zhaojun Pas DE deux, interpreting the Chinese classical dance in a dancing language of implicative characteristics, rhythm and oriental beauty. The simple explanation and fascinating dancing won the audience's warm and prolonged applause. The interaction with the audience attracted many American students and local dance lovers to come on stage and learn the basic movements of classical dance face to face with Chinese actors to experience the "shape, spirit, strength and rhythm" of Chinese dance. 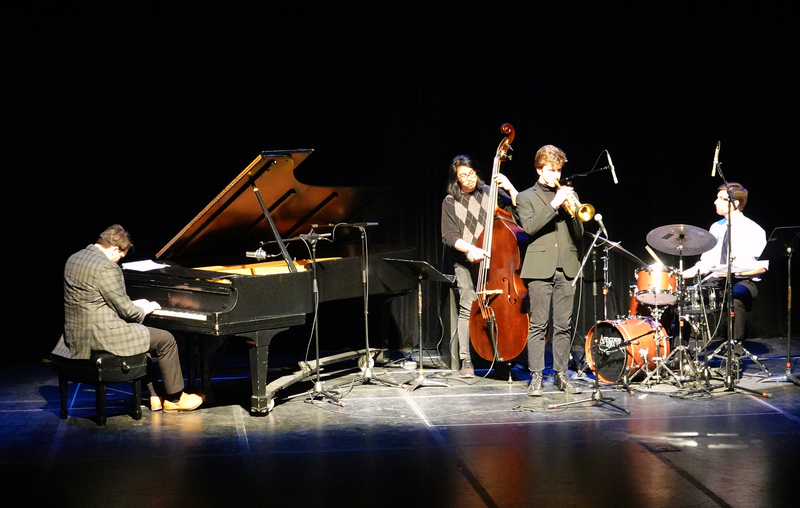 Afterwards, the jazz group of William Paterson university, which enjoys a high reputation in the United States, performed original jazz music. They also invited the performers of Zhaojun and local dance lovers to perform impromptu dance on the stage, pushed the atmosphere of the scene to a new climax. In a warm atmosphere, President Helldobler, Deputy Consul General Mr. Jin Qian and Mr. Ning Xu raffled 20 tickets to the audience for the premiere of Princess Zhaojun at Lincoln Center in New York. President Helldobler and CCART hosted a dinner for distinguished guests at William Paterson University. Ms. Margaret Lam, Mr. David Yen and Mr. Ip- Wong Kong who are Honorary Directors of CCART, Dr. Sandra DeYoung, Acting Provost and Senior Vice President for Academic Affairs, Ms. Pamela Ferguson, Vice President for Institutional Advancement and Dean Daryl Moore from William Paterson University attended the reception. The dinner was hosted by Professor Zhiyuan Cong. President Helldobler congratulated on the success of the lecture in the afternoon and presented gifts to the Chinese performers on behalf of William Paterson University -- Professor Cong’s exhibition album at the National Museum of China. 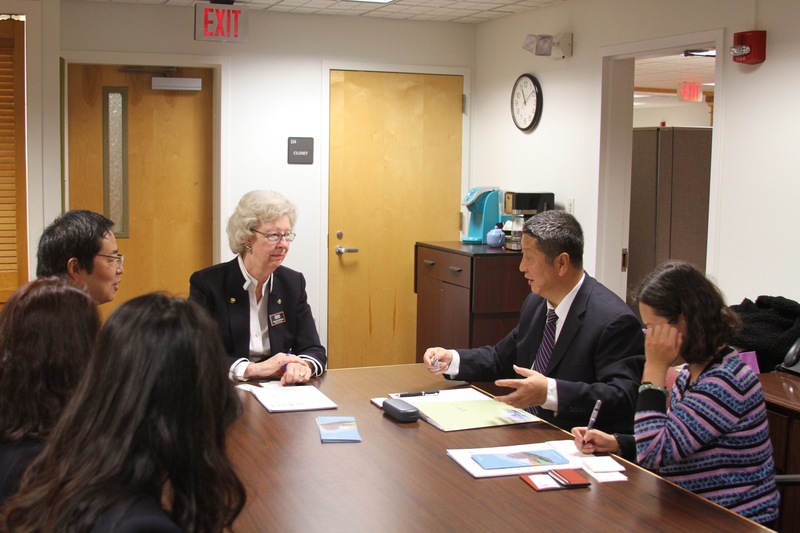 Ms. Chunmei Chen thanked President Helldobler for inviting the Chinese performers of Princess Zhaojun to visit William Paterson University and do the culture talk. She said the dance drama tells the story of ancient Chinese woman Zhaojun's marriage to the frontier and her quest for peace. Nowadays, there are Zhaojun such as the dancers present here. We came here across the ocean to deepen the mutual understanding between peoples. Audience were moved and sighed with emotion when the event was over. A lady from New Jersey said Chinese dance is so rich, charming and fascinating. She saw an American audience move to tears several times, deeply impressed and convinced by Chinese art. Mr. Xue saw the event news and drove from Philadelphia with his wife and daughter, his daughter happily had an interaction on stage with the dancers and he thought it fruitful, too worthy! A faculty of WPUNJ said the performances represented the top art of the Chinese dance and the lecture made us know the rich connotation in Chinese folk dance, congratulations on the success of the event and many thanks to CCART! 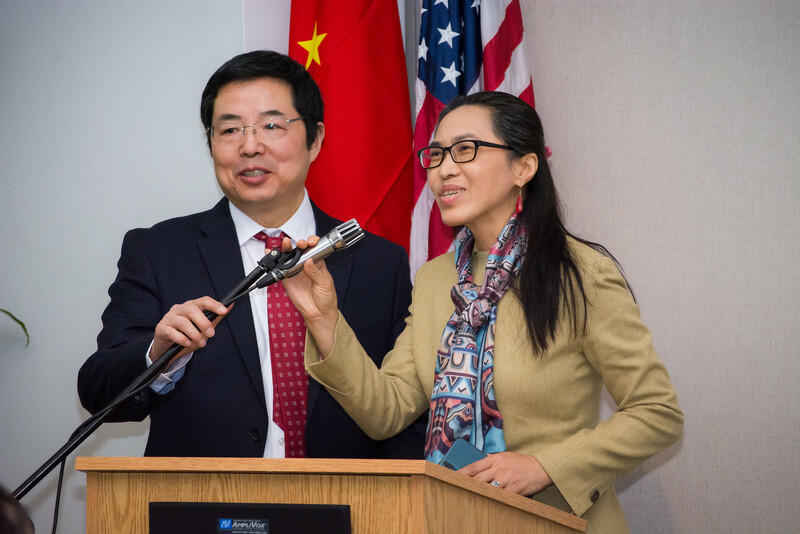 Prof. Zhiyuan Cong said it is very honored for CCART to host this event, we especially show our gratitude to Ms. Chunmei Chen, who recommended the Chinese Culture Talk to us, and to the support of Chinese Consulate General in New York, as well as William Paterson University! 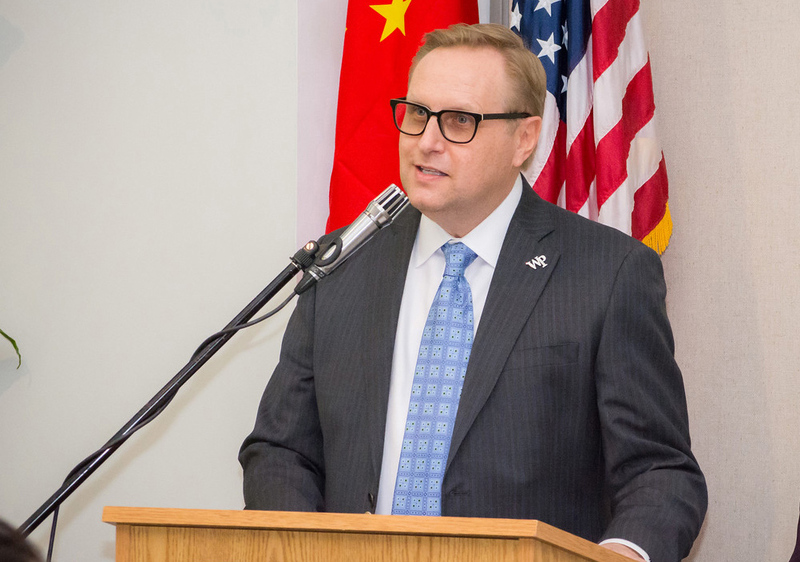 This year marks the 40th anniversary of the establishment of diplomatic relations between China and the United States, and the 10th anniversary of CCART. It is a great opportunity to do the dance art exchange in the professional field and mainstream society of the United States. We will continue our efforts in launching a series of high-level cultural and artistic exchanges between China and the United States. There will be more wonderful events and surprises waiting for the audience! For more information about this event, please call the Center for Chinese at William Paterson University at 973.720.2799 or email ccart@wpunj.edu, or visit web wpunj.edu/ccart. 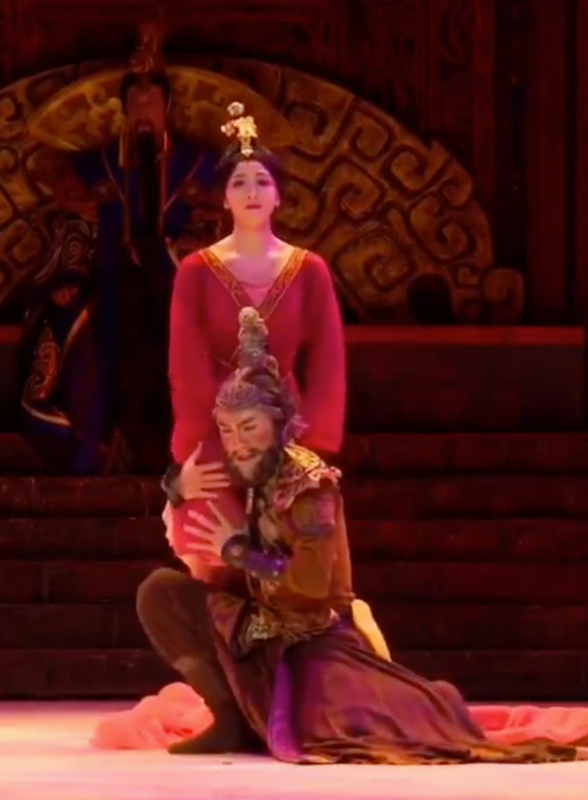 Members of the elite China National Opera and Dance Drama Theatre will perform selections from Princess Zhaojun at the Shea Center for Performing Arts at William Paterson University in Wayne, N.J., on Tuesday, March 19 at 3 p.m. The performance is free and open to the public. 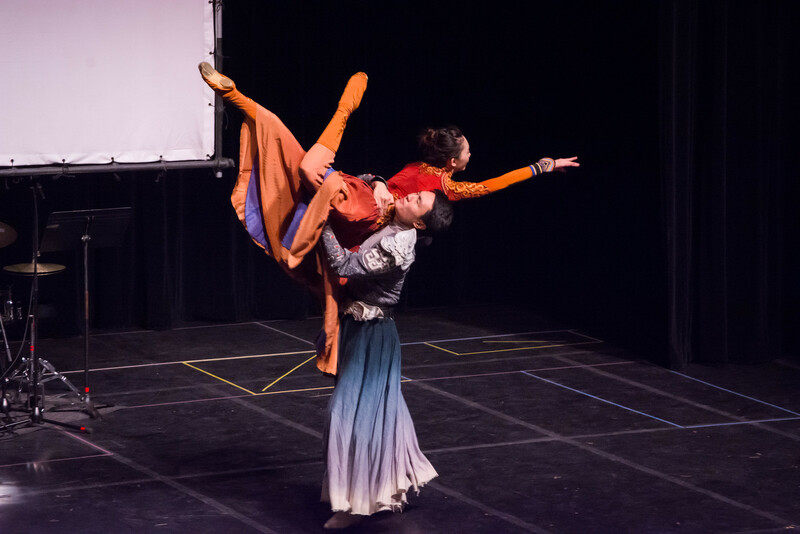 There will be three performance selections that will include an introduction to the art of Chinese dancing, Chinese folk dance, and a scene from Princess Zhaojun, as well as audience interaction. The performance includes dance, drama, opulent costumes and live traditional Chinese music. 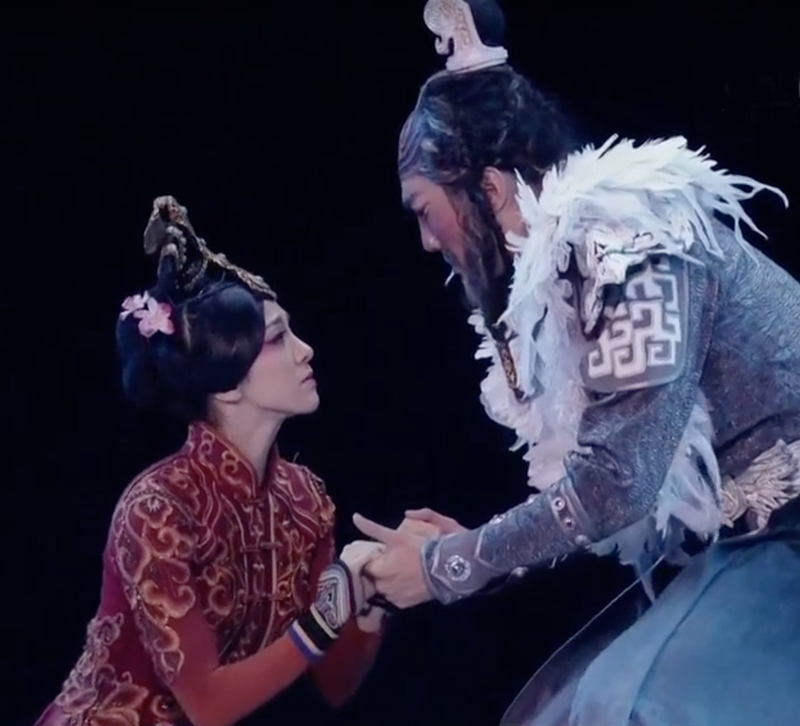 The deputy director of the China National Opera and the Dance Drama Theatre will intersperse the performance with commentary explaining the story and history of the performance. The centuries-old story of Princess Zhaojun brings to life the real story of one of China's most important heroines, Wang Zhaojun, then an imperial concubine, who sacrifices her comfortable palace life to secure peace on the turbulent border of northern China. The Chinese performers are among the best in China; their performance at William Paterson University will take place following a run in Boston and prior to multiple performances at Lincoln Center’s Koch Theatre in New York City. This production had its world premiere in 2016 and has since toured throughout China. In 2017, it performed in the National Auditorium of Mexico as a closing performance of “Year of Chinese Culture” in Mexico to wide acclaim. Faculty and students of William Paterson University, professional and amateur dancers, dance groups, art lovers are cordially welcomed to participate in the art interaction and exchange with the top dance crew and performers from China. Free, but advance registration is required. Click the button to register. 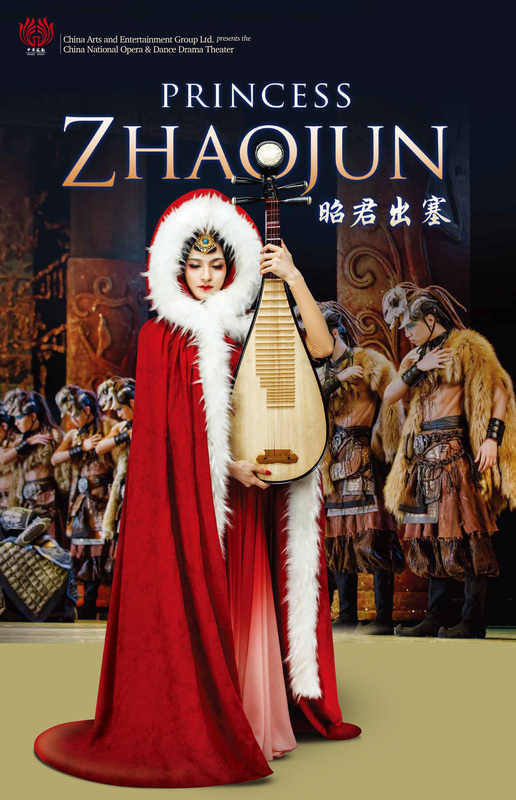 Tickets for the Dance Drama Princess Zhaojun in NYC will be raffled off at the end of the performance. Center for Chinese Art, Department of Art, College of the Arts and Communication. Center for International Education at William Paterson University. A $400 non-refundable travel expense deposit is required for registration. Students in the program who register for six credits will be awarded $500 from the Shanghai William Chinese Art Foundation Fellowship. 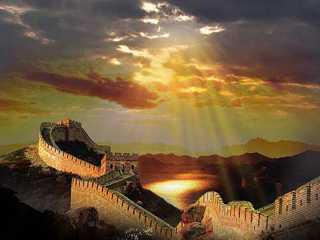 Summer Art in China is a unique study abroad program that was founded on the understanding and appreciation of Chinese art, which over the course of the trip will present different lectures, demonstrations and workshops from instructors and master artists in China. The program will enable American students to view Asian culture from a new perspective and to absorb elements in a different cultural tradition from their own artistic articulation and elaboration. A secondary purpose is to encourage and prompt more frequent art exchanges between the East and West, as well as demonstrate the connection between ancient and modern traditions in the field of Chinese Art. There will also be special activities including visits to the studios of working Chinese artists, and to museums and institutes of traditional and modern art and architecture in Shanghai, Xuzhou, Teng Zhou, Qufu, Mount Tai, Xining, Qinghai Lake, Jiayuguan, Dunhuang and Beijing. This study abroad program offers over five weeks of intensive classes with faculty from William Paterson University of New Jersey, the Shanghai Art Museum of China in Shanghai, Tengzhou Museum of Han Carved Stone, Confucius Museum, Mencius Museum, Dunhuang Grottoes, and Tsinghua University. For more information about the trip or to schedule an appointment for registration, please contact the Center for Chinese Art at William Paterson University by emailing ccart@wpunj.edu or calling (973) 720-2799. 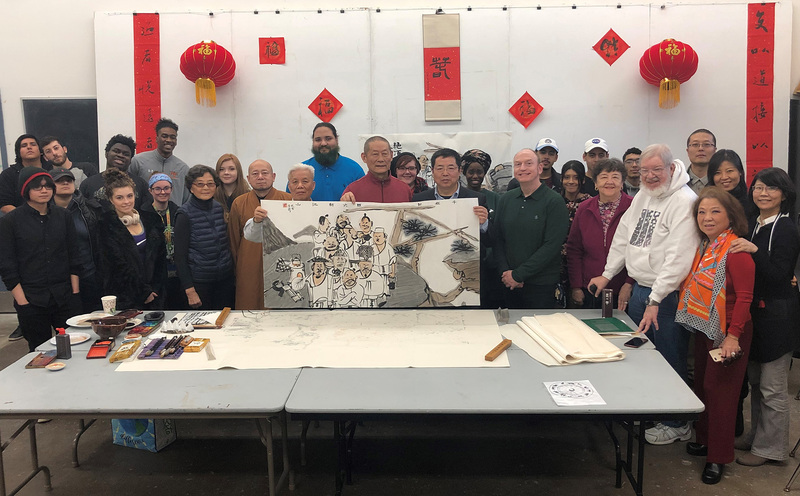 In celebration of the 2019 Chinese New Year, the Year of the Pig, the Center for Chinese Art at William Paterson University organized an art feast that served communities in both New Jersey and New York. 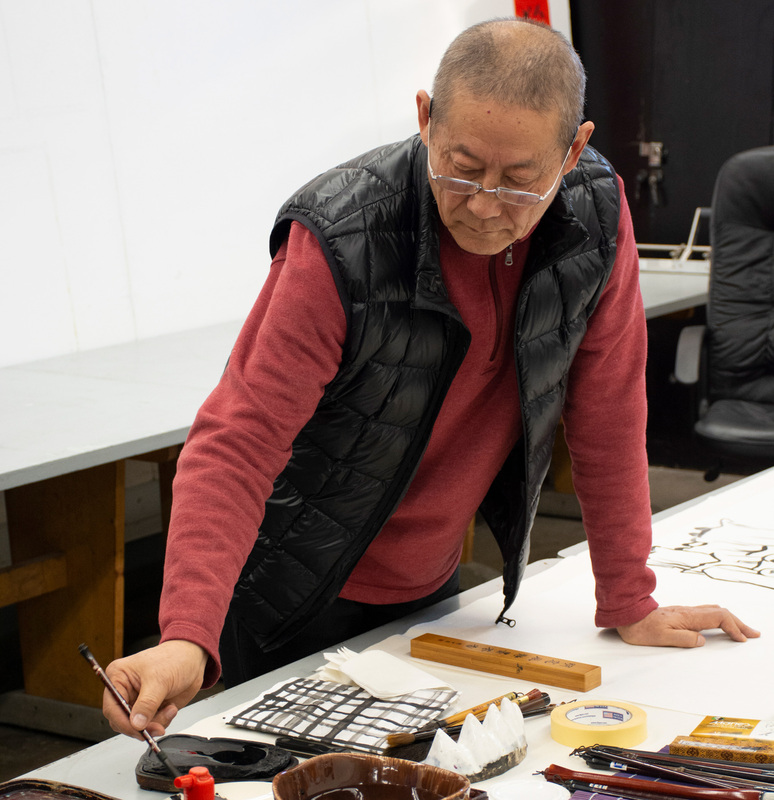 Professor Mengqi Wang, a famous Chinese ink painter and leading figure in China’s new literati painting circle, was invited to the United States to hold his exhibition, demonstrate his skills and lecture about his recent work. Mengqi Wang was Professor and Chair of the Chinese Painting Department at the Nanjing Arts Institute and Professor of the Fine Art College at Shanghai University. 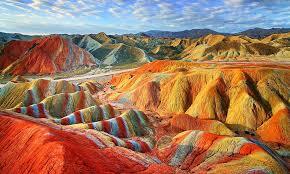 Currently he is a researcher at the China National Academy of Painting in Beijing. Over the past several decades, Professor Wang has been immersed himself in traditional Chinese art and culture, through which he has created a unique artistic language by refining key elements of Chinese ink painting such as form, composition and abstraction. In addition, he has made tremendous contributions to the craft as a whole, especially by further developing different styles of Chinese Literati Paintings. 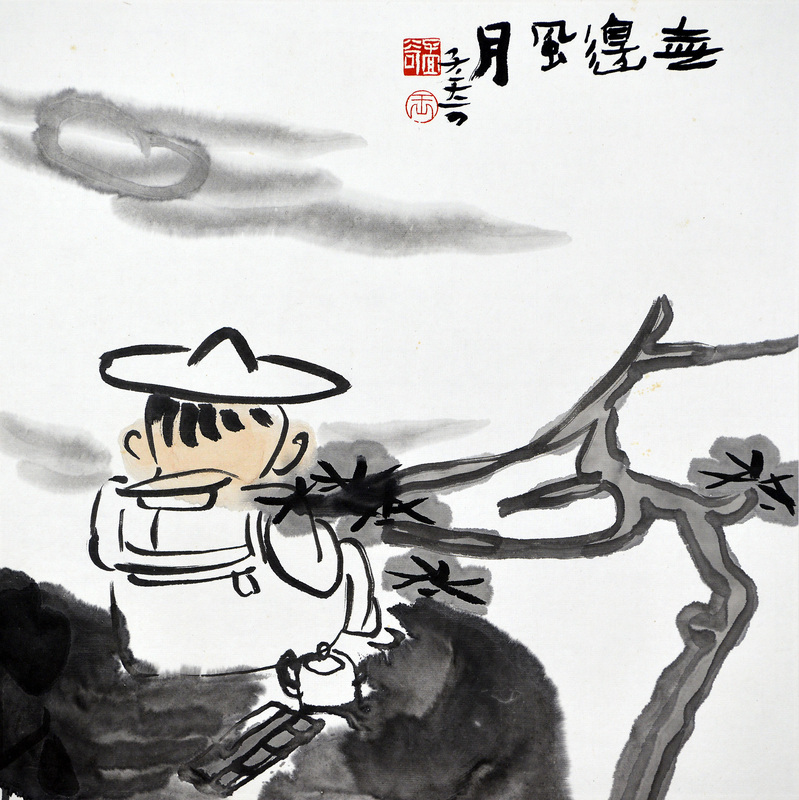 His ink figure paintings, coupled with his views on art and life, have influenced a whole generation of Chinese artists. 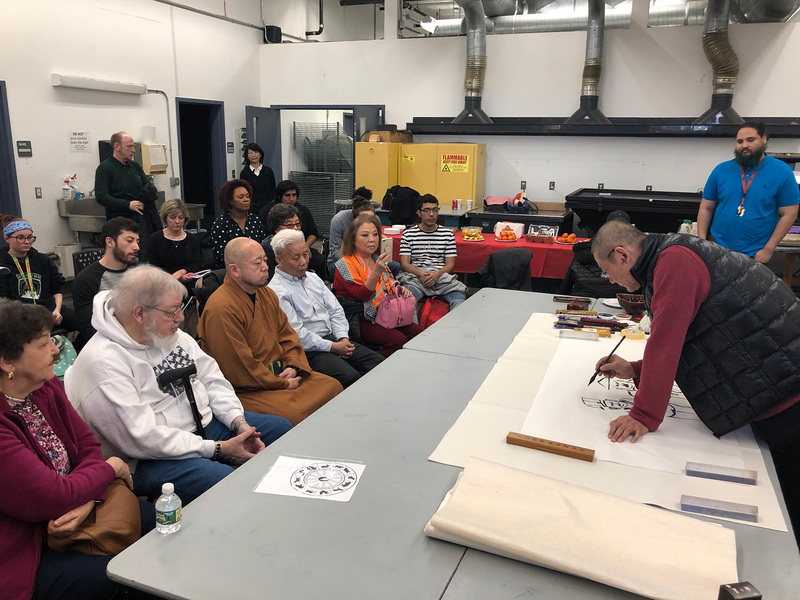 On February 5th, the first day of the Chinese New Year, Professor Wang gave a wonderful demonstration of Chinese ink figure painting to the students, faculty and art community at William Paterson University’s Power Art Center. The audience was deeply impressed by his warm personality and elegant brushwork, showing his skillful imagination in painting extraordinary compositions. A professor of animation at WPUNJ mentioned that Professor Wang painted more than ten characters during his demonstration, with each character vividly depicted with their own personality and characteristics. Wang’s talent filled him with great admiration, and the students were encouraged by seeing his process firsthand. It was truly a remarkable opportunity for everyone in the audience, allowing for a new perspective on approaching art. 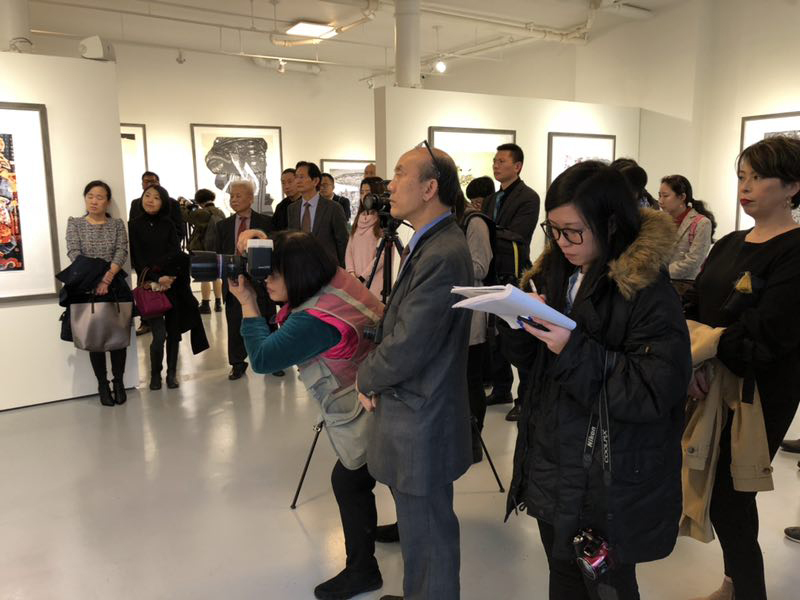 On February 9th, the exhibition “Where the Heart Belongs: An Exhibition of Chinese Ink Paintings by Mengqi Wang” had its grand opening at the New York Gallery of Chinese Art (91a Allen Street, NYC). 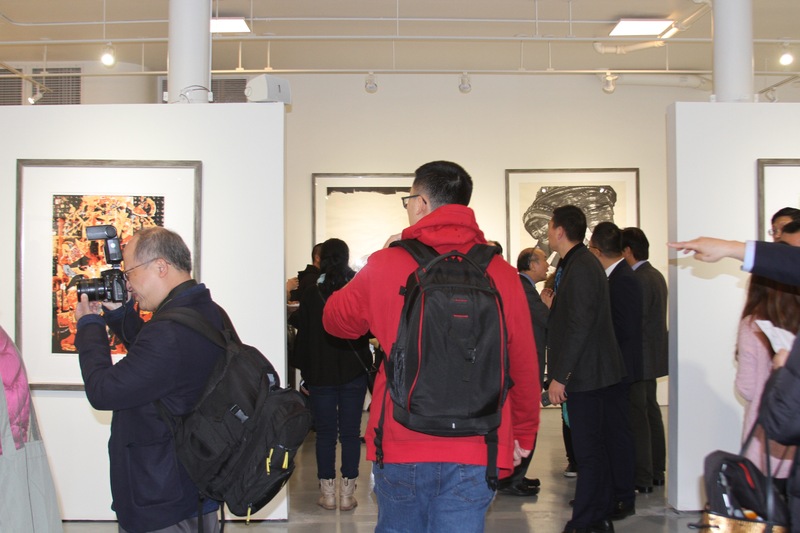 The exhibition was organized by the Center for Chinese Art at William Paterson University, the New York Gallery of Chinese Art, USA and is sponsored by the Chinese Painting and Calligraphy Research Institute at Beijing Jiaotong University, China. The exhibition opening brought over one-hundred in attendance to the gallery, all deeply impressed by the work that was on display. While taking in his paintings, viewers could feel a burst of emotion ripple throughout their hearts. Daryl Joseph Moore, Dean of the College of Arts and Communication at William Paterson University attended the exhibition and told reporters that the artist had used such superb brushwork to bring all of his energy into his paintings. 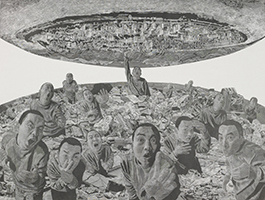 The exhibition, which runs until March 10th, features 55 of Mengqi Wang’s most recent works. 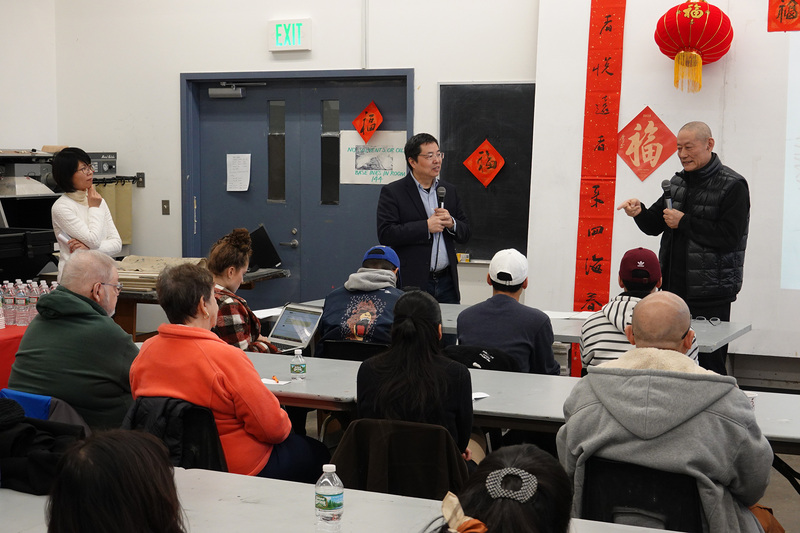 February 19th, Professor Wang presented his lecture, “Mengqi Wang and China’s New Literati Painting” to the students at faculty at Power Arts Center at WPUNJ. 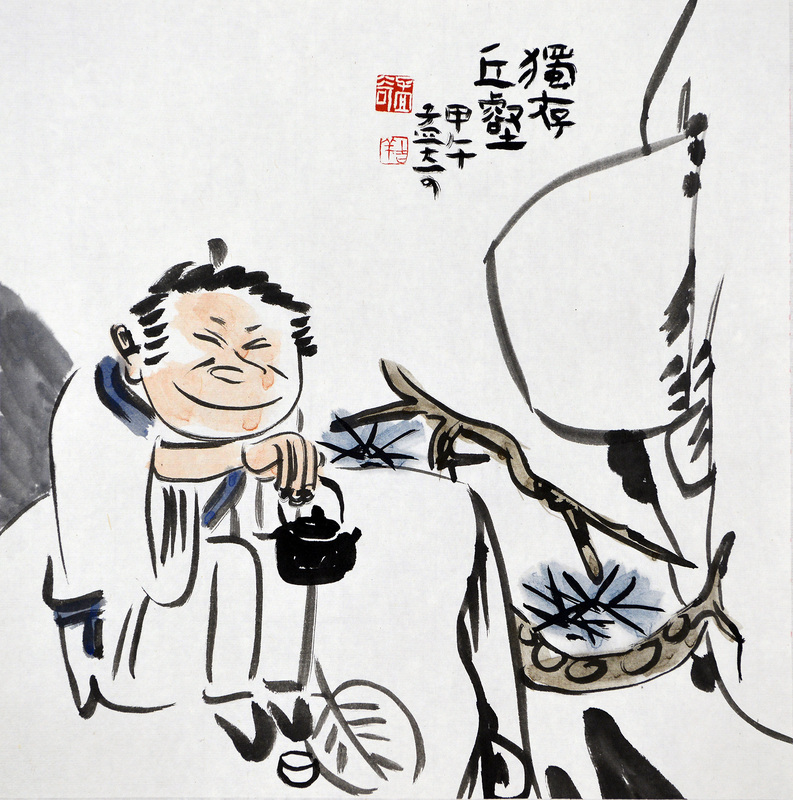 In the lecture, Professor Wang introduced the materials of Chinese ink painting, the techniques of brush and ink, the six methods of Chinese painting and shared the personal feelings, ideas and thoughts in his works. He also mentioned that in the long history of Chinese art, Dong Qichang and other artists in the late Ming dynasty and early Qing Dynasty were his favorite painters and sources of inspiration. Professor Zhiyuan Cong, Director of the Center for Chinese Art at William Paterson University and curator of Mengqi Wang’s exhibition and art events, spoke to reporters about his intention behind planning this exhibition. In his opinion, just a few artists from China truly understand Chinese art and are able to reached such a high level of ability and success. We should introduce more Chinese artists like Mengqi Wang to the western countries, who represent the original, essential and top level of Chinese ink painting. Mengqi Wang is a leading figure of China New Literati Painting circle. He was the Chair and Professor of Chinese Painting Department at Nanjing Arts Institute and Professor of Art College at Shanghai University. Currently he is a researcher at the China National Academy of Painting in Beijing. His works have displayed in Chinese National exhibitions and international exhibitions such as China: 5,000 Years, Innovation and Transformation in the Arts at Guggenheim Museum. For decades, Wang has been immersed in traditional Chinese culture, reading and researching. He created his unique artistic language by refining form and composition, the key elements of Chinese ink painting, into his own personal abstract style, which prompted his paintings with bolder cultural spirit, simpler ink lines and unique style. Mengqi Wang not only inherits the traditional Chinese painting essence but also is fully embedded with contemporary concepts which made him one of the most successful contemporary Chinese painters, also a great contribution to Chinese Literati Painting’s inheritance and development. 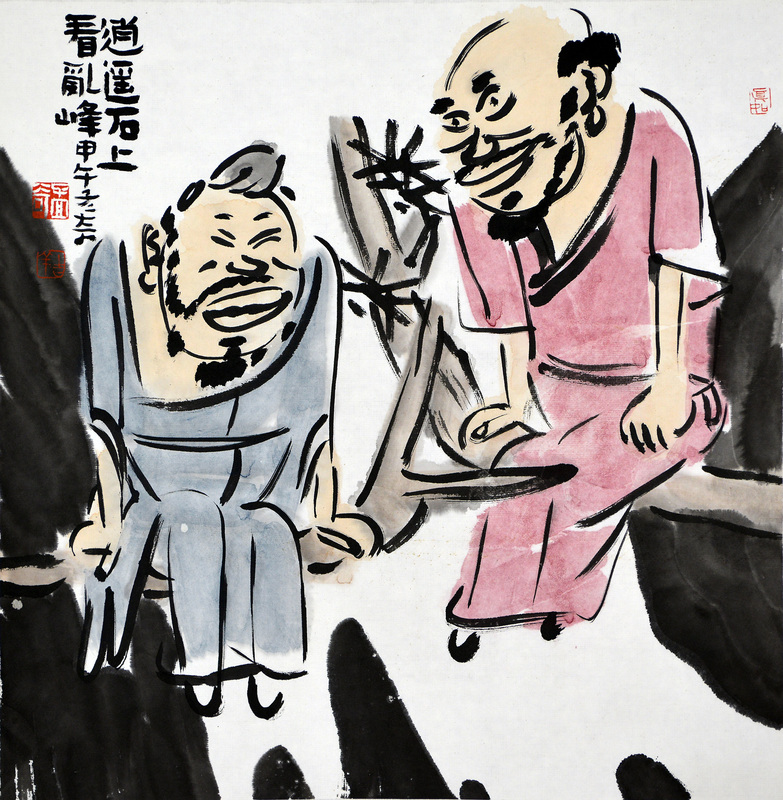 His figure ink paintings, together with his views on art and life, have influenced a whole generation of China in the field. On November 4 and 5, 2018, a delegation from Yangzhou University led by Guohong Chen, Vice President, Yangzhou University; Weigang Lu, Director of Human Resources; Li Guo, Dean of College of International Exchanges; and Ting Yao, Director of music performance at College of Music; Yan Lu, teaching and research section director of vocal music at College of Music; Di Sheng, Professor at College of Music in Yangzhou University visited William Paterson University at the invitation of Professor Zhiyuan Cong, Director of Center for Chinese art at William Paterson University. Dr. Sandra DeYoung, Acting Provost and Senior Vice President for Academic Affairs, Professor Daryl Joseph Moore, Dean, College of Arts and Communication, Dr. Loretta Laughlin Vignier, Associate Dean, College of the Arts and Communication, Professor Diane Falk-Romaine, Chair, Music Department and Professor Cong, met with the delegation respectively. 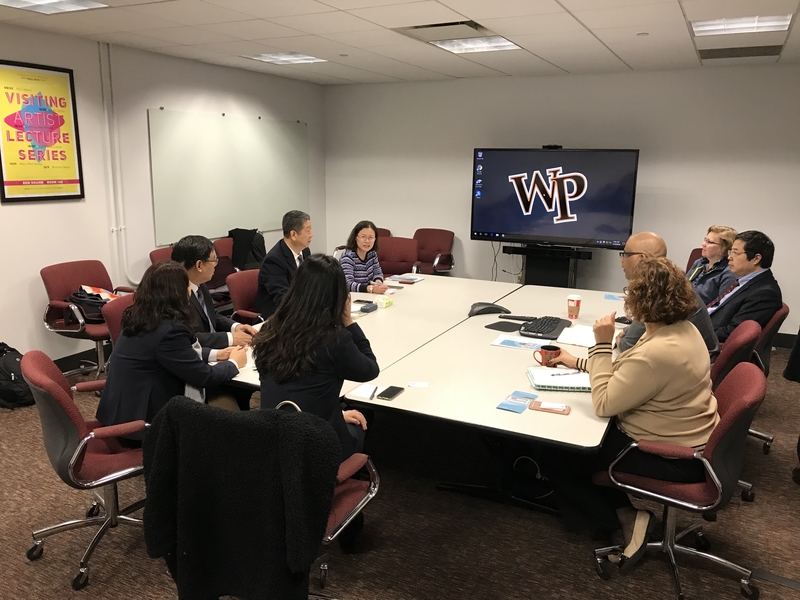 The two sides reached consensus on further deepening the cooperation between Yangzhou University and William Paterson University, and put forward new ideas on exchanges in art, music, education and other areas, as well as faculty and students' visits. Yangzhou University, founded in 1902，is a public and key university in Jiangsu Province, China, with more than 50,000 undergraduates, graduates, and adult education students. In 2000, Yangzhou University signed a cooperation agreement with William Paterson University to establish a friendly relationship. The two universities had successfully conducted academic exchanges and visits of university administration, faculty and students since then. 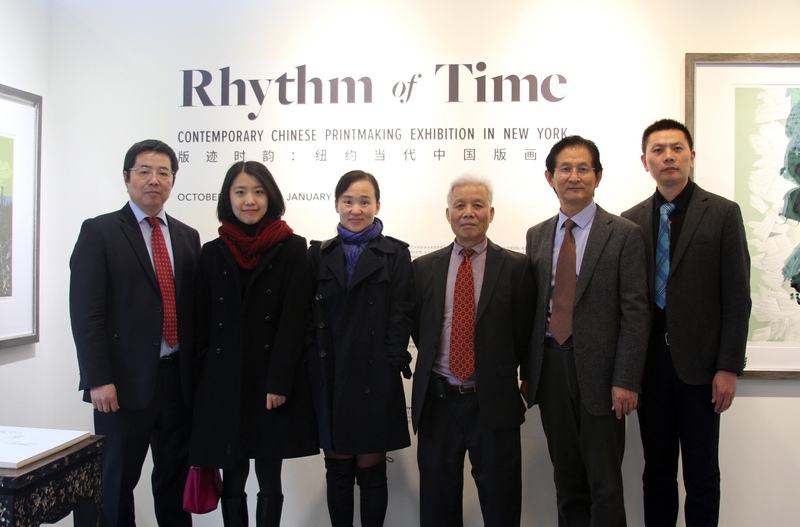 At the invitation of professor Zhiyuan Cong, Director of Center for Chinese Art at William Paterson University, a group of 12 Chinese contemporary printmaking artists led by Chao Chen, Associate Director of Jiangsu Provincial Printmaking Academy, visited New York and New Jersey for printmaking exhibition and academic exchange from October 26 to 30, 2018. 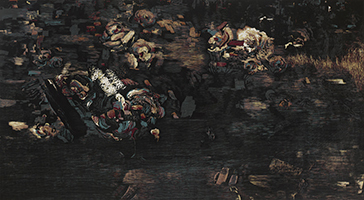 The exhibition artists include Daquan Dai, the leading figure in Chinese contemporary printmaking, as well as more than a dozen key figures in Chinese printmaking, including Qinglu Yuan, Minjie Zhang, Guirong Luo, Qiongde Cao, Jianshan Wang, Yanpeng Li, Chengyou Yu, Xu Qi and Chao chen, who have won gold medals at the China and international printmaking exhibitions in recent years. There are also more than 20 rising talents such as Haonan Tan, Jianxiang Zhu, Bin Zhou and Yunzh Zhoui, who won gold and silver medals in China's national printmaking exhibitions and youth printmaking competitions. 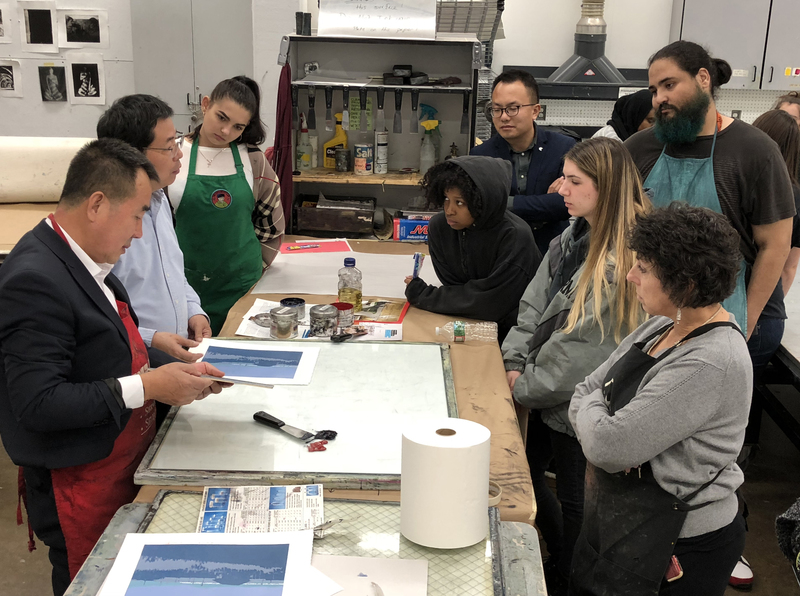 On October 30, the delegation of contemporary Chinese printmakers came to William Paterson University for a day of intensive, fruitful visits and exchanges. 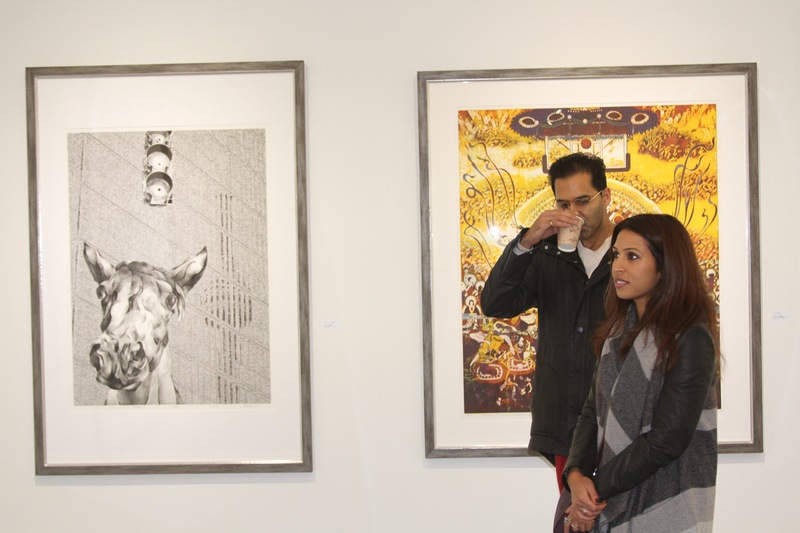 The artists visited the campus and Center for Chinese Art at William Paterson University in the morning. From 2:00pm-5:00pm, lectures and demonstrations were held at the Power Art Center. 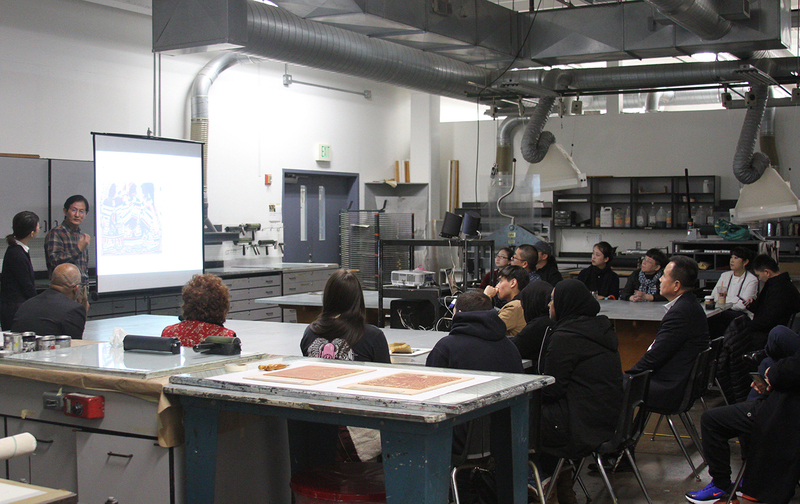 Then from 6:00pm-9:00pm they participated the workshop in our print studio with the faculty and students. 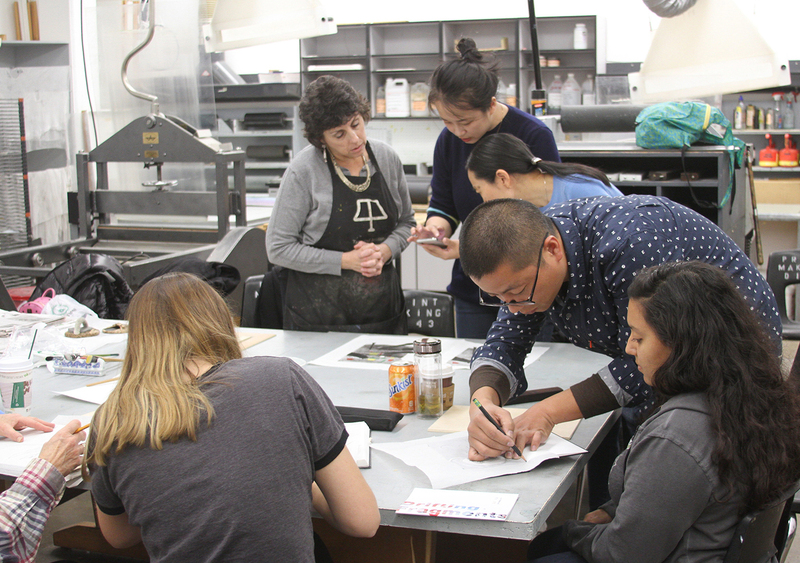 The students studied and created Chinese printmaking artworks under the guidance of three groups of visiting artists. Chinese artists and our students were all excited and looking forward to more cultural events in the future. 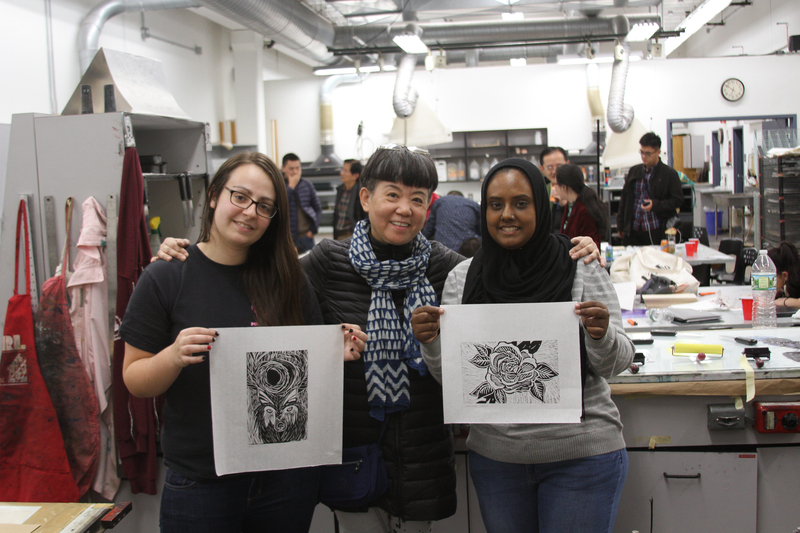 Professor Cong said that the Center for Chinese Art at William Paterson University will continuously plan and organize China-US art exchange activities, and printmaking will be a focus of the center’s projects. The Chinese artists left New Jersey on Oct. 31. The exhibition continues through January 26, 2019 at the Gallery located at 91a Allen Street in Manhattan. Gallery hours are Wednesday through Saturday from 10 a.m. to 5 p.m. and Sunday from 11 a.m. to 6 p.m.
For more information about this event, please call the Center for Chinese at William Paterson University at 973.720.2799 or email ccart@wpunj.edu， or visit web www.wpunj.edu/ccart. You also can call New York Gallery of Chinese Art at 646 639 0873, or email info@nygcart.com, or visit web www.nygcart.com. 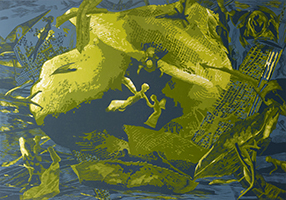 Organized by Center for Chinese Art at William Paterson University and New York Gallery of Chinese Art, NYC, sponsored by JSCPA ART GALLERY of China, Rhythm of time: Chinese Contemporary Printmaking Exhibition in New York will be held from October 27,2018 to Jan. 26, 2019. Center for Chinese Art at William Paterson University also invites a visiting group of 14 Chinese contemporary printmakers to visit William Paterson university on October 26, 2018, solstice on October 31, 2018. Visiting artists will hold lectures, demonstrations and attend the opening ceremony of the exhibition. 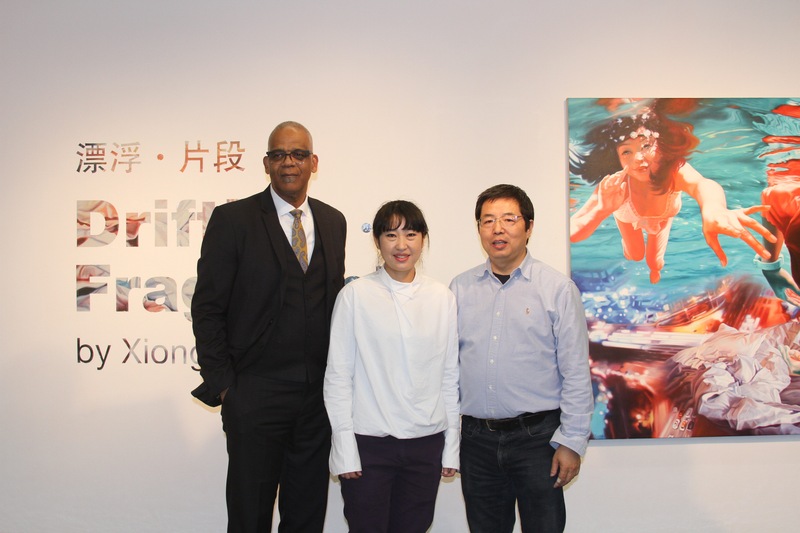 Under the academic guidance of Professor Daquan Dai, Associate Dean of Academy of Printmaking, China National Academy of Painting and Professor Daryl Joseph Moore, Dean of the College of Arts and Communication, William Paterson University, the exhibition is curated by Professor Zhiyuan Cong, Director of Center for Chinese Art at William Paterson University and is co-curated by Mr. Chao Chen, Associate Director of Jiangsu Provincial Printmaking Academy. 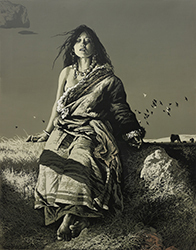 They carefully selected 160 works by 40 outstanding contemporary Chinese printmakers and masters to be exhibited in New York for the first time. 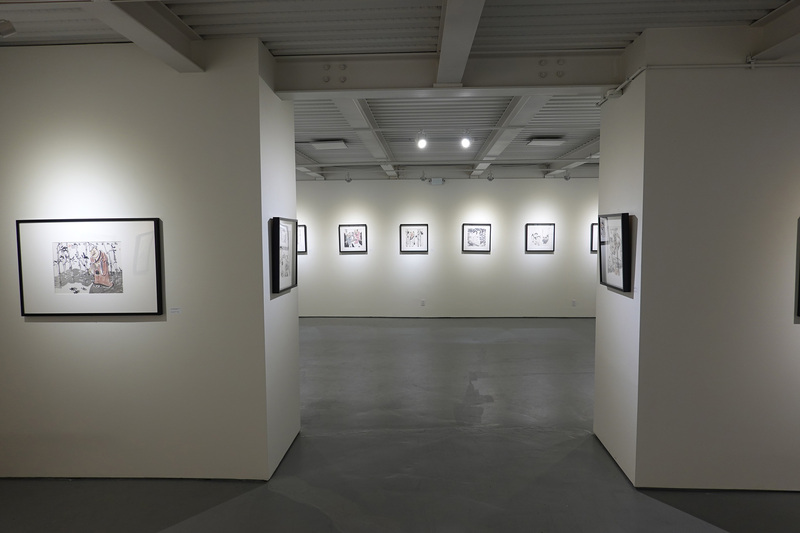 These artists include winners of China's national and local printmaking exhibition awards, even winners of national exhibition gold medals, not only the leading figures, but also a number of new talents. This program has received support and funding from Shanghai William Chinese Art Foundation of China, JSCPA ART GALLERY of China and Mr. Ip- Wing Kong of New York. Jinngbo An, Ling Ban, Feng Cai, Qiongde Cao, Chao Chen, Zhiyuan Cong, Daquan Dai, En Hao, Ping Hao, Xianwu Hu, Shicheng Ji, Wuwu Lei, Xun Li, Yanpeng Li, Lianfang Liang, Bo Liu, Gen Liu, Jing Liu, Linge Liu, Yanfei Liu, Guirong Luo, Wei Peng, Xu Qi, Haonan Tan, Xiaoyun Tang, Jianshan Wang, Ruiqing Wang, Shuai Wang, Jiantang Wu, Yuqing Xia, Chengyou Yu, Tao Yu, Wufeng Yu, Qinglu Yuan, Minjie Zhang, Bin Zhou, Yunzhi Zhou, Hua Zhu, Jianxiang Zhu and Shiwei Zhu. Present Situation and Thinking of contemporary Chinese Printmaking, by Chao Chen, Associate Director of Jiangsu Provincial Printmaking Academy. Printmaking Demonstration by Xu Qi, Professor, Art Academy of Chongqing University. For more information about this event, please call the Center for Chinese at William Paterson University at 973.720.2799 or email ccart@wpunj.edu，or visit web www.wpunj.edu/ccart. You also can call New York Gallery of Chinese Art at 646 639 0873，or email info@nygcart.com，or visit web www.nygcart.com. 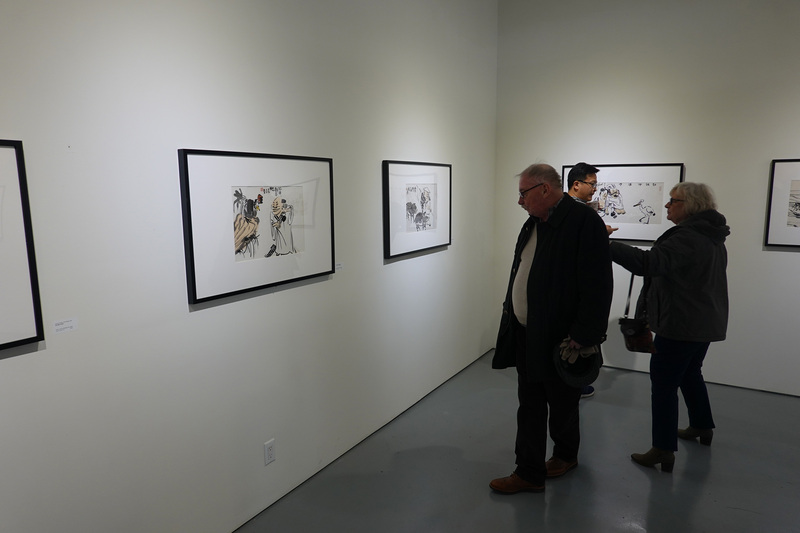 The William Paterson University Center for Chinese Art and the New York Gallery of Chinese Art opened the exhibition Rhythm of Time: Chinese Contemporary Printmaking on October 27, 2018 that continues through January 26, 2019 at the Gallery located at 91a Allen Street in Manhattan. Gallery hours are Wednesday through Saturday from 10 a.m. to 5 p.m. and Sunday from 11 a.m. to 6 p.m. The exhibition is sponsored by the JSCPA Art Gallery of China. 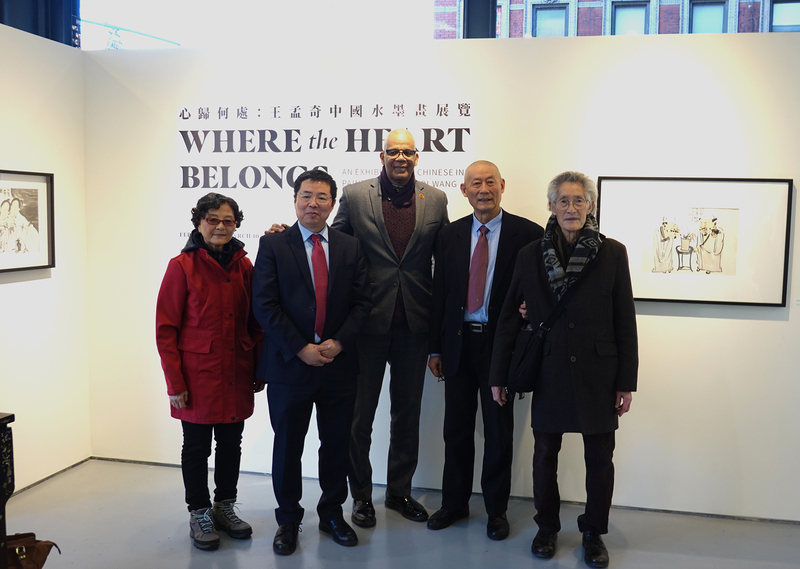 Consular Xiaochen Ma, Chengcheng Liu, Consulate General of the People’s Republic of China in New York, Daryl Moore, Dean of the College of Arts and Communication at William Paterson University, Ip- Wing Kong, Director of the New York Gallery of Chinese Art, Sam Zhu, Chairman of Chinese Contemporary Culture and Art Foundation USA, and fourteen exhibition artists led by Chao Chen, Associate Director of the Jiangsu Provincial Printmaking Academy and Ping Gu, assistant of general manager, Jiangsu Center for the Performing Arts. Over one hundred viewers from New York and New Jersey were in attendance for the opening ceremony. 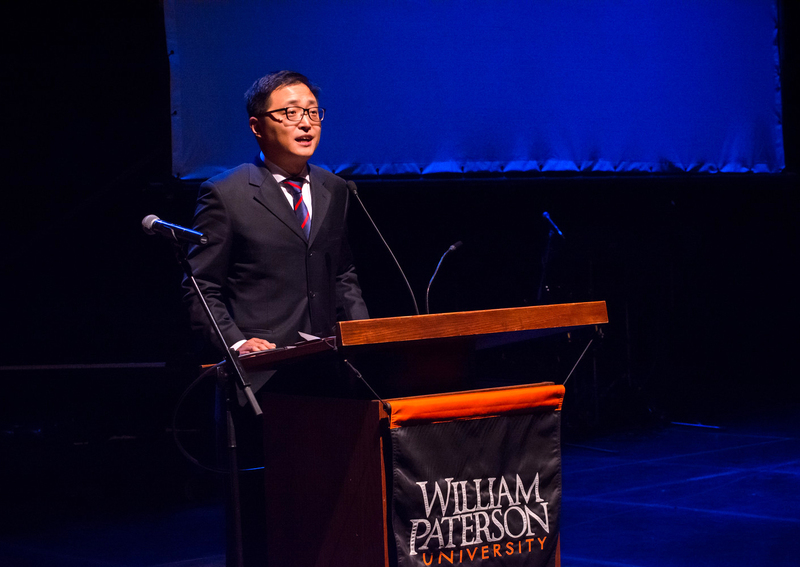 Professor Zhiyuan Cong, curator of the exhibition and director of the Center for Chinese Art at William Paterson University, presided over the opening ceremony and delivered a speech. He introduced the purpose of jointly planning the exhibition with Mr. Chao Chen. 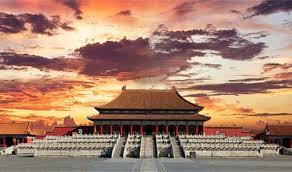 China is the birthplace of printmaking in the world, and Chinese printmaking has developed rapidly in recent decades. In particular, its contemporary woodcut printmaking is unique in the world and occupies a leading position. At the same time of this year's world print fair in Manhattan, New York, we introduced the best contemporary Chinese printmaking and printmaking artists to New York, the center of modern art, and the center of world printmaking, to promote the exchange, understanding and development of east-west culture and printmaking art. Daryl Moore, dean of the William Paterson University College of the Arts and Communication, and Daquan Dai, associate dean of the Academy of Printmaking at the China National Academy of Painting, organized the exhibition with co-curators Zhiyuan Cong, William Paterson University professor of art and director of the University’s Center for Chinese Art, and Chao Chen, associated director of Jiangsu Provincial Printmaking Academy. 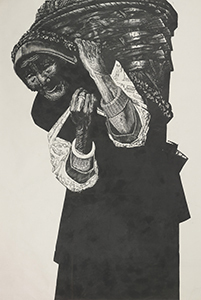 The curators selected 160 works by 40 contemporary Chinese printmakers and masters who are first-time New York exhibitors. 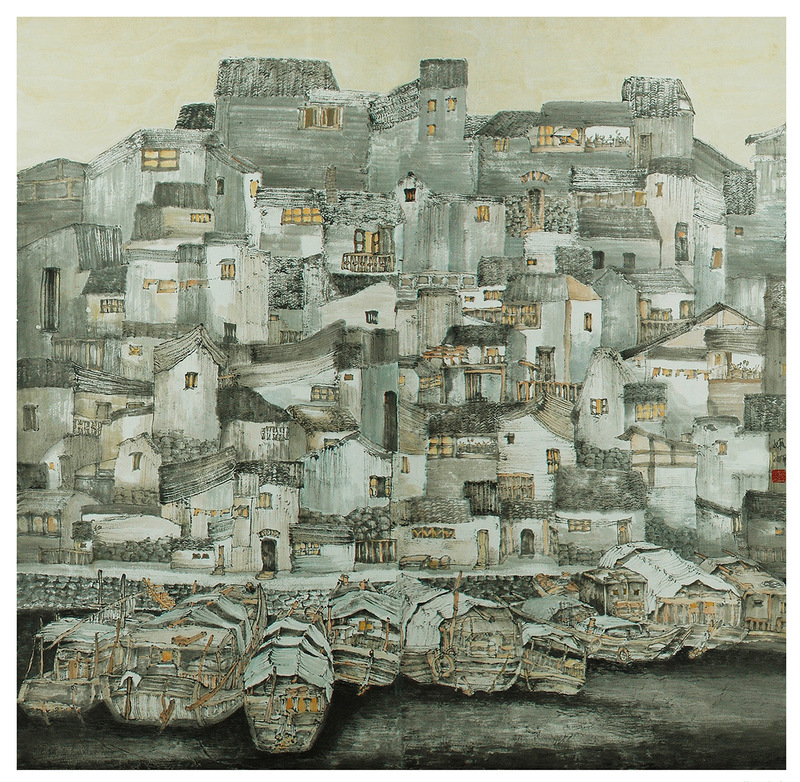 These artists include winners of China's national and local printmaking exhibition awards, winners of national exhibition gold medals and artists on the rise. 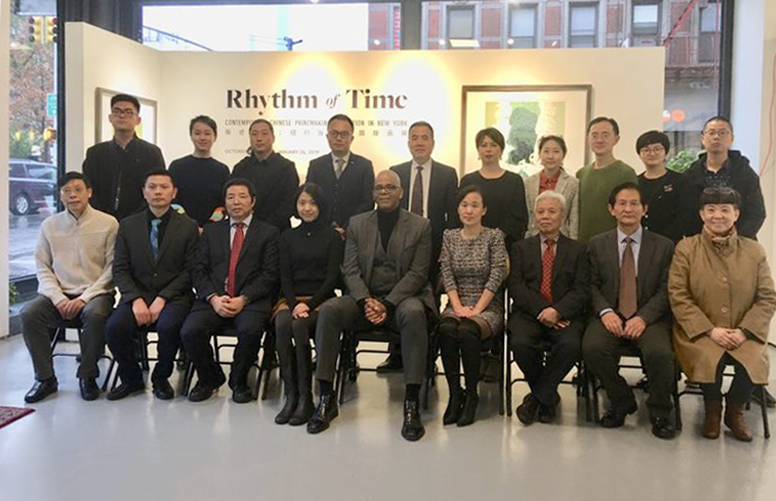 The program received support and funding from the Shanghai William Chinese Art Foundation of China, the JSCPA Art Gallery of China and Mr. Ip-Wing Kong of New York. For more information about this event, contact the William Paterson University Center for Chinese Art at 973.720.2799, ccart@wpunj.edu or visit www.wpunj.edu/ccart. Professor Lijun Xiong's art exhibition "Drifting Fragments" "opens at the Power Art Gallery at William Paterson University on Oct 30, 2018. The faculty, students of the university as well as the delegation of Chinese Printmakers from China, participated in the opening reception. Professor Zhiyuan Cong, Director of the Center for Chinese Art hosted the reception. Professor Daryl Joseph Moore, Dean of the College of Arts and Communication, congratulated the opening of the exhibition. Professor Xiong introduced the concept of her paintings and answered the audience's questions. The exhibition runs from 19 Octoberto November 9, 2018. Lijun Xiong is Associate Professor of Painting Department of Sichuan Fine Arts Institute, Director of the Teaching and Research Office of the Painting Department. She is a representative of China's "cartoon generation" young painters. In December 2017, she came to the U.S. for a one-year visit as a visiting scholar of the Center for Chinese Art at William Paterson University. 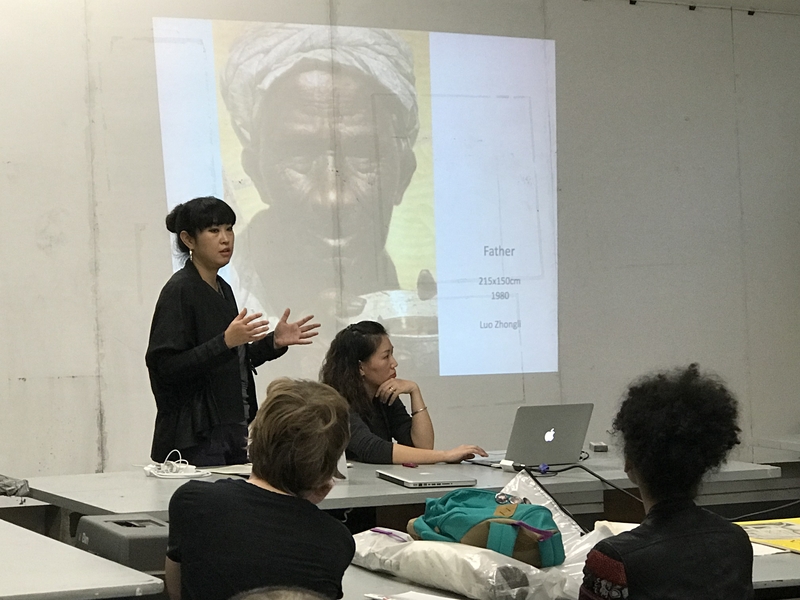 On November 6, Professor Xiong gave a lecture at Power Art Center, entitled "The Art Heritage of Sichuan Fine Arts Institute & Lijun Xiong’s Artwork". In the lecture, she introduced the emerging artists and works of Sichuan Fine Arts Institute in different times, especially the development of contemporary art in Sichuan. Then she talked about her idea of personal creation and two different stages of painting. Finally, she introduced the teaching system in the Painting Department of Sichuan Fine Arts Institute and her students' works. Listened with great interest, the students showed their love to Xiong’s artworks and fully interacted with her by asking questions. Xiong's exhibition and lecture have been highly remarked by the students and faculty at William Paterson University. Xiong lijun is a professor, oil painter at Sichuan Fine Arts Institute, as well as a visiting scholar at Center for Chinese Art at William Paterson University, 2018. Lijun's work focuses on youth subculture and has a strong sense of "the times" (reflecting this era), which is the epitome of popular culture since China's Reform and Opening-up. In her recent works, which have a clear narrative concept of "floating city", have turned more attention to individuals and their living environment. Most of the scenes in her works are various exist in real life, happened all of a sudden and soon faded. Multifarious and exquisite parts of the world meet and overlap like montage, and people in it, constantly switching their thinking between fragments of different scenes, are wandering in the distance and contradiction between ideal and reality. The city not only offers excessive opportunities for humanity, but also breeds endless trouble. Anxiety or easiness, depression or pleasure are all passive choices at the moment. People are trudging in the spirit of self-fulfillment. Her work reflects the dissolution of noble culture in today's society and the loss of the spiritual home of young people. They are like a visual feast of indulgence and self-paralysis. For more information about this event, please call the Center for Chinese at William Paterson University at 973.720.2799, email ccart@wpunj.edu, or visit our website www.wpunj.edu/ccart. Upon the invitation of Prof. Zhiyuan Cong, director of the Center for Chinese Art at the William Paterson University, Mr. Zhipeng Ding, Chairman of the Shanghai William Chinese Art Foundation and his wife Ms. Peilan Miao, daughter Yi Ding visited William Paterson University from May 18th to 22nd 2018. 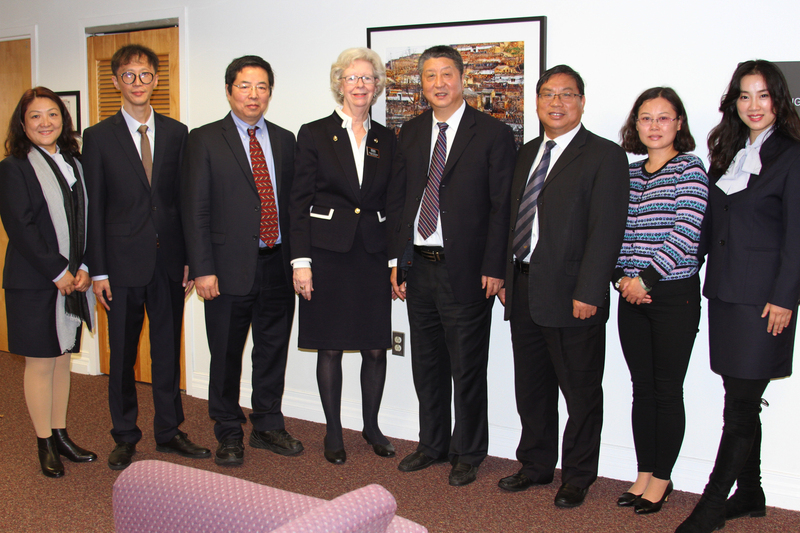 On May 21st, Dr. Kathleen Waldron, President of William Paterson University and Dr. Warren Sandmann, Provost & Senior Vice President for Academic Affairs met with Mr. Zhipeng Ding and his family and gave a welcome lunch banquet for them. 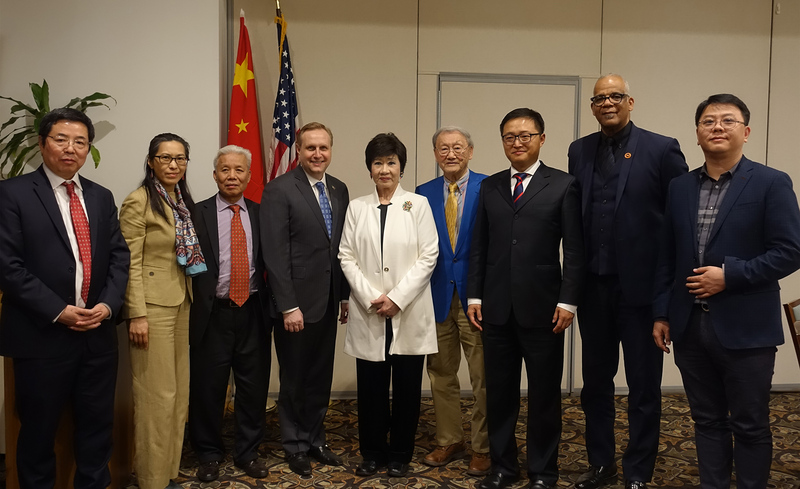 Mr. Daryl Moore, Dean of the College of the Arts and communication College, Mr. Spencer Scott, Director of Major Gifts and Gift Planning and Professor Zhiyuan Cong, Director of the Center for Chinese Art also attended the meeting and banquet. Dr. Waldron addressed that she is very happy to welcome Mr. Ding and his family visiting William Paterson University, she introduced what the Center for Chinese Art has accomplished under the leadership of Prof. Zhiyuan Cong, stressed the importance of the Shanghai William Chinese Art Foundation and its support, without which all the programs and achievement would not have happened. On behalf of William Paterson University, she thanked Shanghai William Chinese Art Foundation, thanked Mr. Zhipeng Ding, its chairs and board members, and asked Mr. Ding to forward her best regards to them. Mr. Zhipeng Ding expressed his gratitude to Dr. Kathleen Waldron and Dr. Warren Sandmann, and very happy to hear all the progress and development the Center for Chinese Art has made under the leadership of Dean Daryl Moore and Prof. Zhiyuan Cong. He will report what he saw and heard during his visit to the foundation board members after he return back to Shanghai, and discuss further support and donation to the Center for Chinese Art. In the evening of May 21st, on behalf of the Center for Chinese Art, Prof. Zhiyuan Cong hosted a family dinner party for Mr. Zhipeng Ding and his family. Honorary director of the Center for Chinese Art Ms. Margaret Lam and Mr. David Yen, Mr. Ip-Wing Kong and Dean of Visual Art College of the Arts and Communication Mr. & Mrs. Daryl Moore attended the dinner. In retrospect, Prof. Cong shared the history of initiating and creating the Center for Chinese Art with Ms. Margaret Lam and Mr. David Yen. He then talked about the future development of the center, thanked all honorary directors’ support and donation. Everyone was excited about the 10 years anniversaries of the Center for Chinese Art in 2019, making plans for the grand celebrating the 10th anniversary program, and the next reunion in 2019. 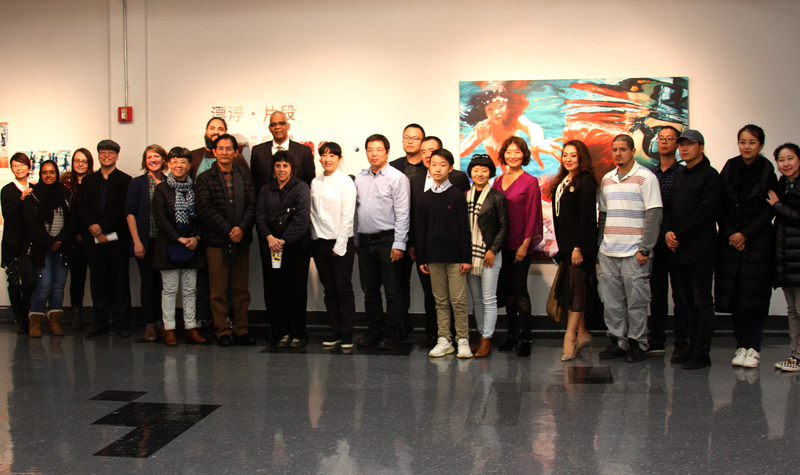 Organized by West Windsor Arts Council in Princeton and in partnership with Center for Chinese Art at William Paterson University and Chinese-American Art Faculty Association, the exhibition Cross Cultural Currents: the Art of Zhiyuan Cong, Chung-Fan Chang, Liqin Tan, Jing Zhou opened at West Windsor Arts Council on May 6th 2018. Ms. Aylin Green, exhibition curator and executive director of West Windsor Arts Council emceed the exhibition opening. She stressed the significance of “Cross Culture” lies in the interaction within different cultural contexts. “Cross Culture Currents” art exhibition is a practical outcome of such interaction. All four Chinese American artists are art professors at four NJ-based colleges and universities, whose artworks indicate the interactivity and crossover amongst different cultures, particularly the advantage of artistic diversity shown under the impact of cultural compatibility. This exhibition aims to show how did different cultures influence their artworks. As the co-organizer, one of the participating artists, director of the Center for Chinese Art at William Paterson University and chairman of Chinese-American Art Faculty Association, Prof. Zhiyuan Cong gave a featured speech at the opening. On behalf of all the artists, the Center for Chinese Art at William Paterson University and Chinese-American Art Faculty Association, Prof. Cong thanked West Windsor Arts Council and its executive director Ms. Aylin Green, especially for her team and their dedicated professional curation and installation; thanked Mr. Shing-fu Hsueh, former Mayor of West Windsor for attending the opening ceremony, and thanked him for creating such a professional art gallery during his tenure that provides space and opportunity for art exhibitions and dialogues. Zhiyuan Cong presents several paintings of his basketball series with which they depict basketball sport as a contemporary American’s religion and a symbol of American’s modern society. He borrowed elements from Chinese Han people figure stone relief for its simple, extravagant and vigorous lines to express masculine, sport and speed. There is also reference to Dunhuang grottoes’ frescoes of North Wei Dynasty, using rich colors to represent religious zest and passion towards basketball game. He hopes people will see the dynamics, the rhythm, the quick pace and life in his paintings as well in our modern society. Chung-Fan Chang, Assistant Professor of Art, Stockton University introduced her “Kite” painting installation. Her work shows influence of Eastern imaginary personal landscape that reflects issues within the society and daily life experience. 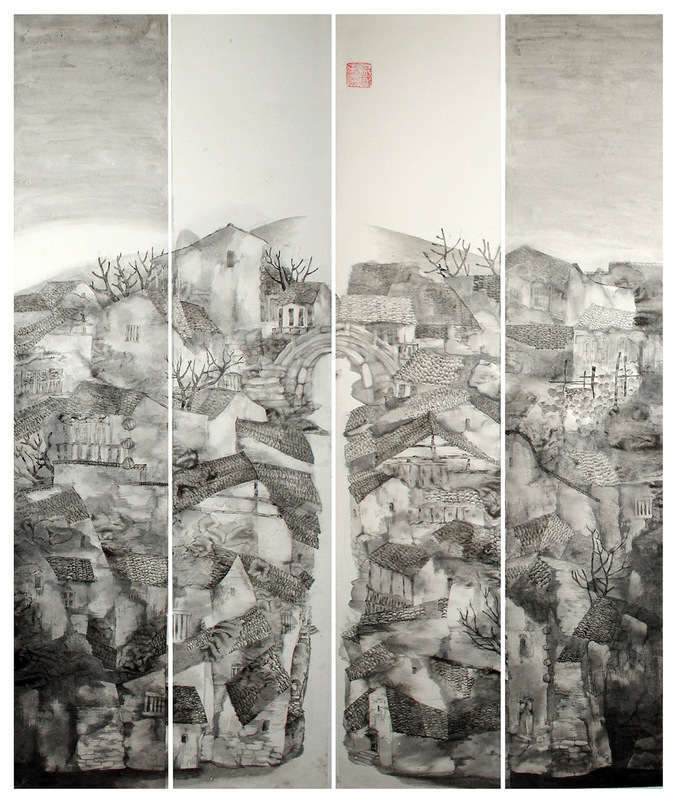 She draws inspirations from life experience, formal Chinese ink landscape and identifies the visual simile of color and its significance in culture. Liqin Tan, Professor of Art Rutgers University-Camden presented his computer graphics “Level Signals” series. The competing concepts of the brain — whether the battle of the brain’s size versus its intellectual expansion, or of its technological capacity versus its spiritual power — are kept in eternal equilibrium. Mr. Shing-fu Hsueh, former Mayor Former Mayor of West Windsor, Mr. Daryl Moore, Dean of the College of the Arts and Communication gave their congratulatory speeches respectively. Opening ceremony last from 4pm to 6pm, more than hundred guests witnessed these four Chinese American artists using their art languages to overcome hurdles, bridge and blend Eastern and Western cultures, touched by their unique artistic forms and styles. Cross Cultural Currents: Zhiyuan Cong, Chung-Fan Chang, Liqin Tan, Jing Zhou Art Exhibtiion runs till June 22nd, all are welcomed. Address: West Windsor Arts Council Art Gallery, 952 Alexander Road, Princeton Junction, NJ 08550. Hours: Mon-Tue 10am-6pm; Sat 10am-4pm. This exhibition is being presented by West Windsor Arts Council and in partnership with: Center for Chinese Art at William Paterson University, Chinese-American Art Faculty Association.Cross Cultural Currents will showcase the work of four Chinese American artists who are also professors at four NJ-based colleges and universities. This exhibition will highlight the cultural influences on their art. Zhiyuan Cong, Professor & Director, Center for Chinese Art at William Patterson University. Tradition is embedded in the cultural heritage of the world. For an artist to reach the peak and achieve artistic eternity, he needs to be conversant with things present and past, drawing from the best of all traditions. Borrowing from the Chinese Han human figure stone relief, which used simple and vigorous to express masculine power, my work aims to portray an indispensable part of American life, namely, the sport of basketball. From the images in both paintings and prints, I hope people will see the dynamics, the rhythm, the quick pace and life in our modern society. Chung-Fan Chang, Assistant Professor of Art, Stockton University. Through the Kite series of painting, works on paper, video, and wall installation, Chung-Fan Chang’s work represents the Eastern influence of imaginary personal landscape that reflects issues within the society and daily life experience. “Kite” refers to the neon color fields in the abstract landscape that imply as intruders to the surrounding. Intruders cross-examine how fluorescent and artificial colors affect our vision and how that restless sensation as a metaphor of continued conflict in society. The abstract landscape calls upon the viewer to ponder, and often allows for ambiguous interpretation. The color is obsessive and disturbing, yet demonstrates authority to demand to be viewed and to attack the viewing experience. The work draws inspirations from life experience, formal Chinese ink landscape and identifies the visual simile of color and its significance in culture. LiQin Tan, Professor of Art, Rutgers University-Camden. Primitive Level Signals – This theme uses spirit levels, commonly used to indicate whether a surface is level, as a signal to illustrate a natural phenomenon in humans, where brain development is an equalized process. The competing concepts of the brain — whether the battle of the brain’s size versus its intellectual capacity, or of its technological versus its spiritual side — are always kept in equilibrium. Jing Zhou, Associate Professor, Monmouth University. Meditation is an ancient healing method in many cultures. Inspired by nature and the Chinese culture, my digital imaging series “Ch’an Mind Zen Mind: Visual Meditations on the Ultimate Reality and Absolute Calmness” reflects my experience in search of inner peace through one of the most widely held oriental philosophies—Ch’an, also known as Zen. Ch’an’s profound wisdom/teaching and Western art inspired this project. Every image in this series carries a unique philosophical concept with different aesthetic approach. I hope to communicate to my audience Ch’an’s subtle atmosphere of Emptiness and Calmness by developing a personal visual language that expresses universal ideas. Creating this series of artwork has allowed me to explore the arts, mythology, and both Eastern and Western culture from a Ch’an perspective. I want to share this experience and hope my viewers to look at my images as if through magical windows into a healing space. For more information, please call the Center for Chinese at William Paterson University at 973.720.2799, or email ccart@wpunj.edu, or visit web wpunj.edu/ccart. You also can call west Windsor Arts Center Gallery at 609.716.1931, or email: info@westwinndsorarts.org, or visit web www.westwindsorarts.org. The Center for Chinese Art at William Paterson University hosted visiting artist Chinese hyperrealist Mr. Jun Leng and his oil painting demonstration, this is part of the Shanghai William Chinese Art Foundation Distinguished Visiting Artist Series. In the morning of April 19th 2018, crowded fans from New York, New Jersey and Pennsylvania waited in long line in front of the Ben Shahn Visual Art Center for the art feast presented by the Center for Chinese Art and Jun Leng. The registration reached peak capacity instantly because of its popularity. Since oil painting demonstration is best done with natural light and could not book a bigger hall suits this requirement, the Center decided to extended the demonstration to a whole full day. All registrants were divided into groups with limited length of time. Each group has 40 people and 45 minutes, demonstration started from 10am, lunch break for an hour, and ended in 5pm. Professor Zhiyuan Cong, director of the Center for Chinese Art at William Paterson University hosted the demonstration. Prof. Cong said that Jun Leng was hoping to have 9 hours for the whole demonstration, but the Center for Chinese Art can only make six-hour arrangement, so after a very brief introduction, Jun Leng dived into the all day long demonstration right away. Prof. Zhiyuan Cong told journalists about all the conversations he had with Jun Leng during his visiting at the William Paterson University. Jun Leng thinks people have been wrongly treated his hyperrealism as photorealism. He emphasizes the differences between “summary” and “refine”. He focuses more on feelings than detailed facts when he observes his objects. For him, “summary” is more about the simplified likeness whereas “refine” is more about depiction of extracted essence. His ability of “refine” all traced back to his knowledge and training on Chinese painting in old days. He highly praises the free style oil painting in China nowadays as it’s an oil painting development on the basis of Chinese cultures. He thinks oil painting in China should have more curriculums on Chinese cultures and traditions, and it’s a dead end and have less profundity if oil painting teaching entirely relies on western methods. He uses ultra thin paint for dark areas to stress the space distance, and he uses thick paint for bright areas to add color richness and layers. Prof. Zhiyuan Cong also told journalists that he admires Jun Leng’s professional work ethic and his respect for art. Right after Jun Leng arriving in America, first thing he kept insisting was to check the studio for his oil painting demonstration and the lighting condition, he hopes to have a fixed light source for the whole demonstration. He really did not care about his travel itineraries. He was also very happy that Prof. Cong chose his printmaking assistant Olha Voytsitska, a Ukrainian student as his oil demonstration model. For better portraying Olha’s student ethos, Jun Leng decisively abandoned her pretty green apron. He also insisted to finish painting the background of the canvas and preparing all the colors in order despite the heavy jet lag hitting him in the afternoon. Prof. Cong was touched deeply and exclaimed: it is hard to succeed, it is much harder to achieve perfection. Jun Leng’s success all started with these basic details. Consul Wenmei Guo and Chengcheng Liu, both from the Cultural Office of the Consulate General of the People's Republic of China in New York, Dean Daryl Joseph Moore, the College of the Arts and Communication of the William Paterson University, and faculty members and students of the Visual Art College of the Arts and Communication at William Paterson University, together with more than 300 people from the tri-state area watched Jun Leng’s painting demonstration. At the end of the demonstration, Dean Moore thanked Mr. Leng’s splendid demonstration on behalf of William Paterson University, thanked the Cultural Office of the Consulate General of the People's Republic of China in New York’s ongoing support and guidance, thanked Prof. Zhiyuan Cong and the Center for Chinese Art for planning and organizing this program, and thanked all the registrants for supporting the Center for Chinese Art and its programs.